A surprisingly robust and capable machine, given its modest price tag. Recommended for: Anyone on a budget, who doesn’t mind doing a bit of manual labor to create their favorite specialty coffee drinks. Are you on a budget? If you are, then you might be thinking that a decent espresso maker is simply beyond your reach. Thankfully, however, that’s not true! 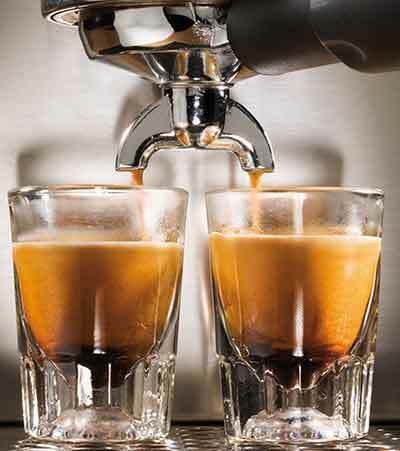 While it is true that, barring a sale, you’ll be hard-pressed to find a full-featured super-automatic espresso maker offered for a song, semi-automatic machines are a viable option and well worth considering. The key difference here is that super-automatics are true “bean to brew” systems, meaning that they come with built-in grinders, and offer one-touch convenience. You put the beans in the hopper, select your drink of choice, then sit back and wait for a minute or two until it’s ready. With a semi-automatic, there’s a bit of manual labor involved. These machines don’t come with built-in grinders, so you’ll need to either provide your own or stick with using pre-ground coffee. Purists will almost certainly prefer the former approach, as using fresh ground beans produces a better, more flavorful drink, but again, if you’re on a budget, pre-ground may be the way to go. Because there’s no grinder, it also means that you’ve got to manually prepare the grounds for each shot, loading and tamping for every drink you make. This isn’t a process that takes a long time, and if you’re looking for an opportunity to enhance your Barista skills, semi-automatics will certainly provide them. Mostly it comes down to convenience. If you want to maximize it, you’re better off saving your money and getting a super-automatic. If you don’t mind working a bit for it, semi-automatics offer surprisingly robust capabilities at a fraction of the cost, and the Gaggia Classic is an excellent example of this. We’ll go over everything this machine is capable of in our detailed Gaggia 14101 Classic espresso machine review, and outline the things it’s just not designed to do so you’ve got all the information you need to make an informed purchasing decision. Let’s get started! 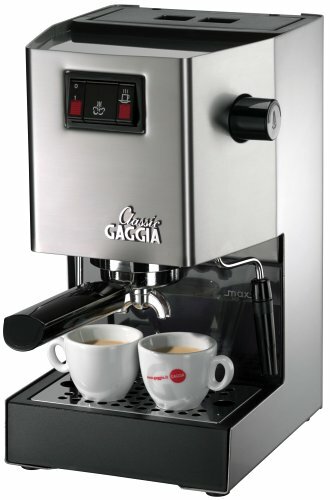 The first thing you’ll notice about the Gaggia Classic 14101 is that it’s ruggedly built. While it’s true that it does have a few black plastic highlights, the casing is brushed stainless steel, which makes it a durable, attractive, if somewhat unassuming machine. It also gives it a fair amount of heft, with the solid casing contributing most of the unit’s 20 pounds of weight. It measures 25” x 13” x 12” so it’s big enough to be noticeable but small enough that most people won’t have any difficulty finding it a permanent home, even in kitchens with limited counter space. This is an important part of our GaggiaClassic espresso machine review, and on paper, the machine looks fantastic, with an impressive 72-ounce, top loading water reservoir, but there’s a problem. The suction hoses inside the tank don’t extend all the way to the bottom, so in practice, you’ve got closer to 64 ounces. That’s still nothing to sneeze at, but we were somewhat disappointed by the reduction in capacity, especially given the fact that this would be an easy problem to solve. Also note that the water tank is not removable, making it similar to most drip-brew coffee makers. You simply open the hatch and pour your water in when you need more. There’s also no water filter in the tank, which means that you’ll need to spend a bit more time on system maintenance (which we’ll cover in a later section) or use distilled water. Note: ​If you have a water filter installed at the tap in your sink, you can use that in the place of distilled water for the same effect. This will be a short section because as a semi-automatic machine, the Gaggia 14101 Classic espresso machine doesn’t come with a built-in grinder, so you’ll need to either buy one separately or use pre-ground coffee, as mentioned before. Grinders come in two basic varieties: Bladed and Burr. Bladed Grinders are super cheap, but they don’t grind your beans so much as smash them to bits, resulting in a grind that is uneven and inconsistent. You’re better off spending a little extra and getting a Burr Grinder. Where Burr Grinders are concerned, again, you’ve got two choices: Stainless Steel and Ceramic. The stainless-steel models are cheaper, but they have a significant drawback. They heat when you use them, which can sometimes burn your grounds and ruin the flavor of your coffee. ​Ceramic grinders don’t heat up like that, and although they’ll cost a little more, it’s well worth the added expense. The other thing to remember is that getting the grind right can dramatically influence the taste of the coffee you make, so you’ll want to experiment here. In general, the more finely you grind your coffee, the stronger and more robust the flavor. 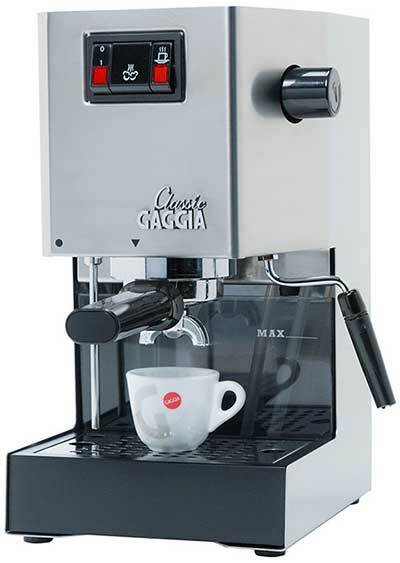 The Gaggia Classic 14101 Semi-Automatic Espresso Machine features a single aluminum boiler, lined with stainless-steel. While we prefer systems that utilize a double boiler, those are virtually impossible to find in entry level machines. The primary advantage of a double boiler is the fact that models that employ them allow you to simultaneously steam milk and brew a coffee drink, which cuts down on your wait time, so mostly, it’s a matter of convenience. As good as the Gaggia Classic is, it doesn’t offer much in the way of convenience, mostly in a bid to help keep the machine’s price low. The Gaggia 14101 Classic also does not have a telescoping coffee spigot. It uses a porta-filter, which you manually load your grounds into. The coffee is dispensed beneath it. This is common among semi-automatics, but it has one potential drawback to be mindful of. You get more crema in your coffee if the spigot is very close to the lip of whatever cup you’re dispensing into. If you’re pulling a small shot into a small cup, you may want to hold it closer to the spigot. It’s certainly not required, but by all means, experiment with it! Here, it’s worth noting that the maximum cup size that will fit under the spigot is just 3.5,” so in most cases, the crema shouldn’t be an issue. What might be though, is if you prefer drinking from bigger coffee cups, as these simply won’t fit in the space you have to work with. 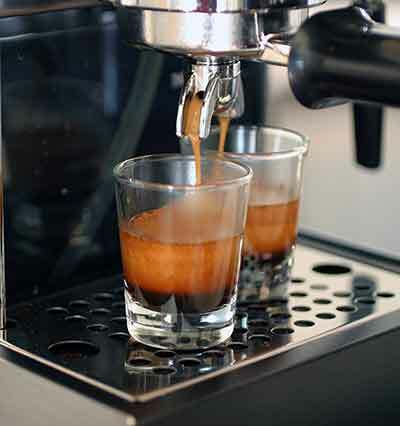 We’ll get into the brew system and the mechanics of making drinks with this machine in the next section, but before we do, it’s important to go over the fundamental differences between how espresso is made, as compared with regular, drip-brew coffee. Drip-brew systems rely on gravity to get the coffee from the grounds chamber to your pot or cup. 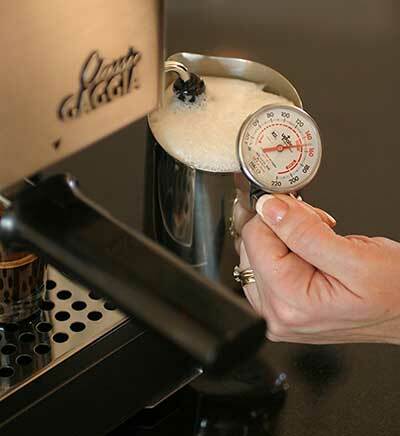 Semi- and super-automatic espresso machines use pressure, which is measured in “bars,” with one bar being equal to atmospheric pressure at sea level. To make a great espresso, you need at least nine bars of pressure, and the Gaggia Classic Semi-Automatic’s pump is rated at fifteen bars, which provides all the power and pressure you need to get world-class espresso with every use of the machine. This is the heart and soul of every espresso machine, whether semi- or super-automatic, and this is where you see one of the biggest distinctions between the two types of units. Our Gaggia 14101 Classic espresso machine review wouldn’t be complete if we didn’t highlight the fact once again that there’s some manual work involved. You load your grounds into the portafilter, tamp them down firmly, then load the filter into the front face of the machine. Once it’s in place, you press the brew button and wait for the coffee magic to happen. First, you get two different filters, one for a single shot, and one for a double. Second, the tamper that comes with this model is made of plastic, and in our view, is just not sturdy enough to get the job done. You’ll want to be careful when tamping, lest you break it, and ultimately, you’ll probably want to buy a sturdier one that will serve you better in the longer term. The control system is about as simple as it can get. There are all of two buttons on the front face, and no sophisticated electronics to fool with, so using the Gaggia Classic is no more complicated than using the drip-brew coffee maker you probably already have. There’s no learning curve here, which is good because the user manual that comes with the machine is stunningly vague and non-helpful (unusual for Gaggia products). Th​​​​​​is is another area we must place special emphasis on as part of our Gaggia ​Classic 14101 review. Coffee purists will love this, while newbies may be a little intimidated. The Classic doesn’t have an auto-frother, relying instead on a Pannarillo wand for steaming milk. The good thing about that is the fact that it gives you incredibly fine-grained control over the quality and quantity of the foam you produce, and the temperature of the milk. The downside is that it takes practice and a bit of skill to use, which is the main reason that people who are new to the world of specialty coffee drinks get intimidated. Don’t let that stop you! While it’s true that the first few milk-based drinks you make with this model probably won’t turn out the way you want them to, but if you keep at it and keep practicing, you’ll master it. Even better, doing that will help you improve your Barista skills, and that’s something that no one will ever be able to take away from you! This will be another fairly short section because the Gaggia Classic doesn’t have a cup warming tray. That’s unfortunate, but also unavoidable. It’s generally the first feature that designers strip out as a cost saving move. Specialty coffee drinks are brewed at temperatures somewhat lower than most Americans prefer their coffee. That’s especially true when it comes to milk-based drinks because you can’t steam milk at temperatures as high as the coffee itself is brewed. When you combine the milk and espresso, you lose heat. If you dispense into a cold cup, you lose even more. The cup warming tray helps to offset that and minimizes heat loss. Fortunately, there’s a simple workaround. Just fill your cup with hot water while you’re making your other preparations, then dump it out into the drip tray (which has a sixteen-ounce capacity) when you’re ready to brew. It’s not a perfect solution, but it’s simple and convenient. So far, as you’ve seen, there’s a lot the Gaggia Classic can’t do, but in some ways, we’ve set it against an unfair yardstick. Semi-automatics simply aren’t designed with as many convenience features. That’s not a failing on their part; it’s simply the way they’re made. One of the areas where semi-automatics really shine though is in their ease of use, and here, the Gaggia Classic stands heads and shoulders above most super-automatics out there. There are no advanced electronics that can break. There are no complicated menus to learn. You’ve got a hatch to pour water into, a porta-filter, two buttons, and a frothing wand, so there’s no learning curve. Yes, it’s true that these machines require a bit of a hands-on approach and a DIY attitude, but they’re pure simplicity, and there’s a lot to be said for that. Cleaning a semi-automatic is a bit different from the more advanced super-automatics as well. Where the supers have on-board computers that drive and automate many of the cleaning functions, there are only two things you have to do here. The first - is periodic descaling, which you can reduce or eliminate by using distilled water or filtered water from your tap. The second - is backflushing, which is a detail that unfortunately gets left out of a lot of Gaggia Classic Model 14101 espresso machine reviews. It’s an important detail, because the Classic doesn’t come with a backflushing disc or a supply of Cafiza, which is a mild detergent designed for use in semi-automatic espresso machines. They’re not expensive, but you’ll need to purchase both not long after you get your machine so you can keep it nice and clean. Backflushing is a pretty simple process. You put the cleaning disc in your portafilter, scoop in some Cafiza, and turn the brew unit on and off five times, shutting it off when you hear the unit beginning to work. This has the advantage of agitating the water and creating cleansing suds. Once you’ve got some, simply pour these into the drip tray, re-insert the porta-filter and activate/deactivate the brew unit five more times, or until you see the last of the suds exiting the system. That’s it. You’re done, and your system is clean. Do that about once a week, and you’re all set. Despite the fact that there’s a lot this machine can’t do, there is a lot to like here. Armed with a machine that can steam milk and make top quality espresso, you can make just about any specialty coffee drink you can dream, and that’s exactly what the Gaggia Classic Semi-Automatic Espresso Machine allows you to do. While it’s true that it doesn’t come with a lot of extra bells and whistles, and that it lacks almost all of the convenience features found on super-automatic machines, it’s got the basics perfectly covered, and provided that you’re willing to do a little work yourself, you can make some real coffee magic happen. Considering all that, there’s only one thing about this machine we’d change, and that is that we’d add a small amount of length to the hoses inside the boiler, which would give you the use of all 72 ounces of the reservoir’s capacity. Any other changes we could recommend (like adding a second boiler, for example), would add significantly to the cost of the machine and take it out of the entry-level price range. Having reached the end of our Gaggia 14101 Classic espresso machine review, you can probably tell that we love this machine, mostly for its sheer simplicity and its durability. It’s true that it isn’t for everyone, and people who are looking for one-touch convenience will not be impressed, but for the right user, this is less an appliance than a tool that enables you to create a broad range of fantastic specialty coffee drinks. 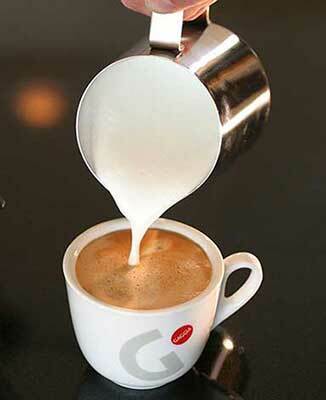 ​Gaggia USA. Official Brand Website. Should I Make Coffee With Distilled Water?. Extra Crispy. What Is a Coffee Grinder? wiseGEEK. Grinding for Espresso – Metal vs Ceramic Burrs. Baratza.